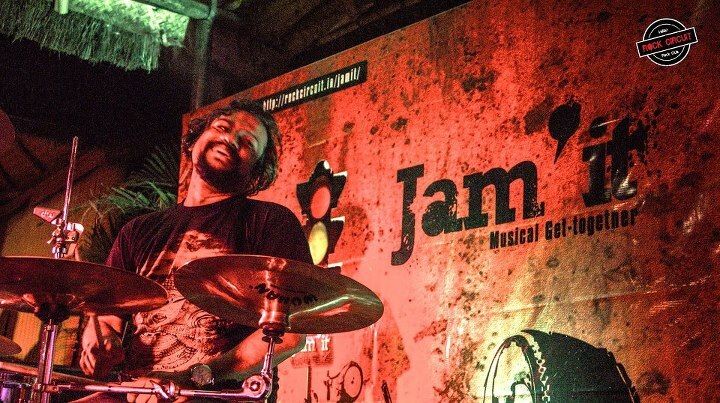 JAM’IT at Cuppa, Bangalore | WhatsTheScene? JAM’IT was held at Cuppa on Sarjapur Road on the 23rd of June. It is a completely new format initiated by Rock Circuit, the focal point being bringing Indian talent to the forefront and giving them a platform to collaborate. Rock Circuit is the brainchild of a few enterprising individuals who are not content with just their day jobs, so they have created something that has never been tried and tested before and it’s probably a smart thing to step outside conventional formats such as music festivals. The buzzword at JAM’IT was ‘collaboration’ and boy did we see a lot of that happening right there in front of us. They were three key acts set to perform - Aks, Welwet Rose and The Indus Valley Project. The stage was set up as three different spaces for drums, guitars and bass. There was an additional electronic kit on stage. This allowed for any number of musicians from these bands to perform with each other creating music on the fly apart from playing their own music. The show kicked off at 6:00 p.m. with The Indus Valley Project and Aks on stage and we went on to see Welwet Rose too and after a point it was hard to keep track of who exactly was on stage! The bands invited the audience to get up on stage too and I got to play some blues with The Indus Valley Project. I was quite surprised at how happily their guitarist handed his guitar over to me which at first I felt guilty taking, but he reassured me saying, “This is what it’s all about man!” We took turns playing solos and singing into the mike and this was the most fun I’ve had at any gig. Swarathma’s Jishnu echoed a similar theme. The music needs to smell and taste of the place from where the musician is. That is why grunge, ‘the Seattle sound’ was so successful. It was true to its roots. Musicians need to write about themes more close to them. He also mentioned how the Indian audience is evolving and no longer wants good cover bands but original music that they can connect to. ‘People are naturally drawn to music that comes from conviction, believe in your music because if you don’t, no one else will’ was his simple yet powerful message. He also mentioned how we’re nearing the tipping point where this scene will soon turn into an industry. Next up we had luthier Arul who makes hand crafted guitars at his workshop in Bangalore. He spoke about some ideas behind building a guitar and encouraged musicians to think about what exactly they wanted in their sound before deciding on what sort of instrument they need. ‘If it’s not in my workshop I’ll build it for you’ he said with a smile. He has made some very exquisite instruments including a hybrid guitar-sarod for Konark Reddy. Swami and Ganesh from Agam gave us some insight into what it takes for a 7-piece band with all of them working day jobs to sustain themselves. Though they’ve had to make several sacrifices to allow their band to survive, their day jobs have allowed them to play only for the fun of it with a complete disregard for commercial compulsions. The also spoke a little about finding your own sound as a musicians and staying clear of stereotypes. Somewhere in between three people from the audience, including some from Rock Circuit formed an ad hoc band called ‘Trident’ and wreaked havoc on stage and boy did they sound good! They should seriously consider keeping Trident alive. They played some no nonsense hard rock and were very tight on stage with good chemistry between the trio. Mahadevan from the yet to be launched Radiofloat excitedly told us about his new internet radio venture. Radiofloat is still in beta testing but has already 80 bands and 400 tracks, all of which are exclusively from India. I am eagerly awaiting their launch and it is a much needed platform for Indian bands. The Indus Valley Project played a short and loud set consisting of originals, easily my favorite band at the event due to my inclination towards ‘straight-up-no-nonsense-old-school’ hard rock. By now I thought I had seen it all, but we were in for a surprise. Members from Aks and Agam, Jishnu from Swarathma and Shikand from Radiofloat took to the stage for an epic jam. There were probably some more musicians on stage but as I said it was getting very difficult to keep track! The jam was great and even with so many people on stage they gelled together really well (there was a short queue behind the microphone). JAM’IT had to be cut short and the last hour jam which was exclusively for the audience to participate in had to be scratched to much disappointment due to lack of time. But all this did was leave us hungry for more and I can’t wait for the next edition of JAM’IT. I’ve even asked Rock Circuit to introduce these sort of jams as weekly affairs at a local pub, so watch this space!